We are often asked how we make our jewelry. So we thought we'd show you what we do. We make our handcrafted jewelry, from start to finish, here in our studio using the lost wax casting process. Lost wax casting is an ancient art form. The oldest known examples of objects created using lost wax casting date back to 3700 B.C. Here's how we use the method in our studio today. Every piece starts as a sketch. 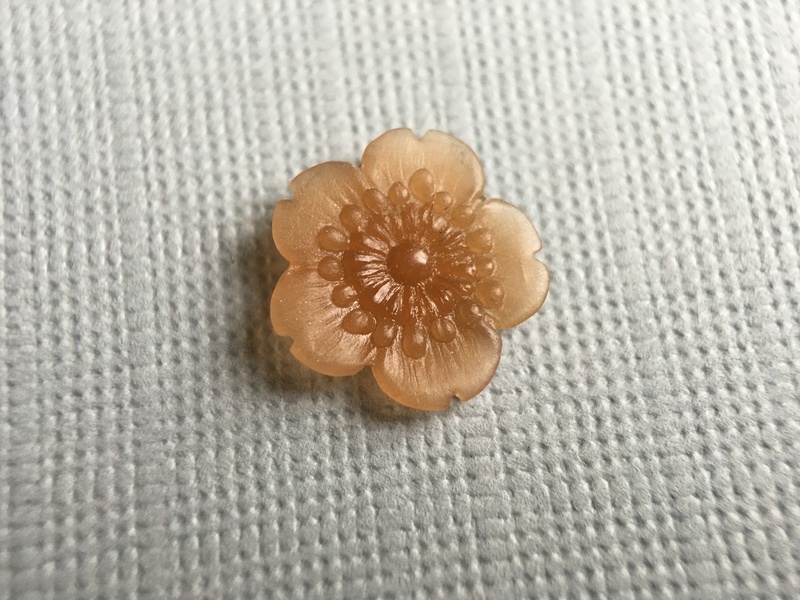 I create the design, then model the design in wax using specialized wax carving tools, files, a straight pin, and magnifying glasses to capture the details. Pictured are flowers in various stages of progress, and the beginnings of a ring. Little Flower in progress. The model on the left is the first version. On the right, is the finalized model. You can see I refined the wax model after casting it the first time. Sometimes it takes a while before a piece feels right, or that it's done. Little Flower cast in sterling silver and used to create a necklace and earrings. 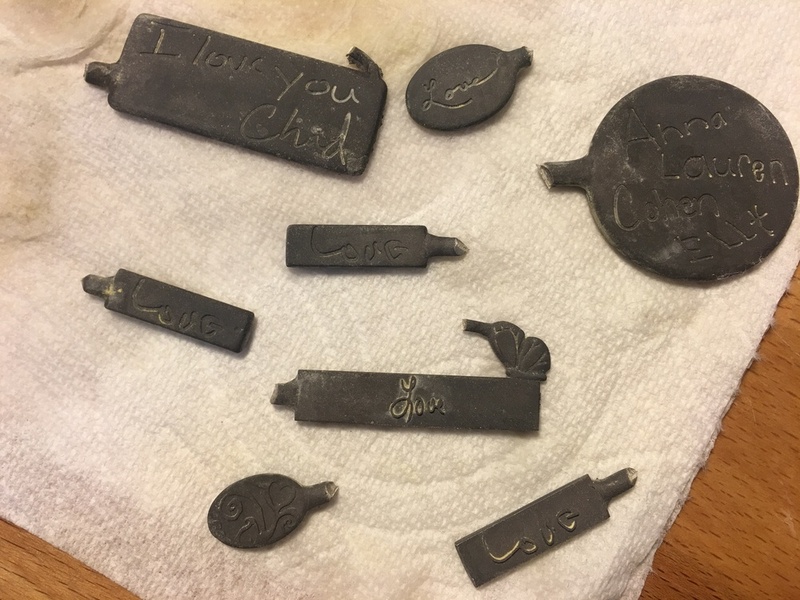 Before we cast the wax in sterling silver, bronze, or 14k gold, molds are made to create duplicates. Even if a piece is a custom, one of a kind item, it is best to make a mother mold. It often takes hours to create the original. 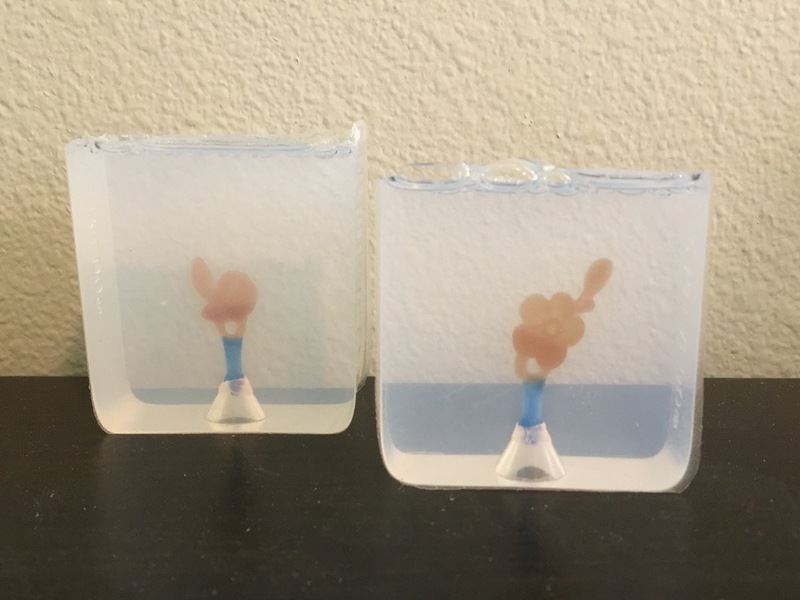 During casting, the wax melts and is lost in the process. Richard does the mold making. Pictured on the top left is the original Folk Flower I carved in gold / brown wax; and a duplicate, made from a mold, in turquoise wax. 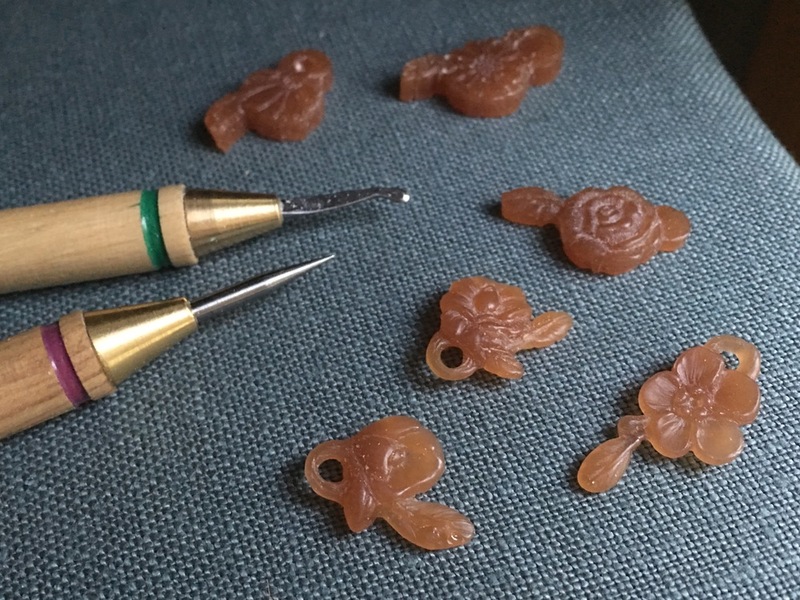 On the top right, original wax flowers in RTV rubber molds. Bottom left, original Old Growth Key Chain, RTV mold, and duplicate. On the bottom right, Little Flower waxes with the original. Even though duplicates are made from molds, each wax needs to be fine tuned after being released from the mold. The waxes pictured are ready to cast. Soon they will be handwriting charms, rings, necklaces, bracelets, and earrings in sterling silver. Richard mills the handwriting in wax for me after I prep and layout the handwriting customers send to us for their custom orders. He gives me the wax milled with the handwriting; I finish and refine the shape and design by hand. I build a structure called a tree. 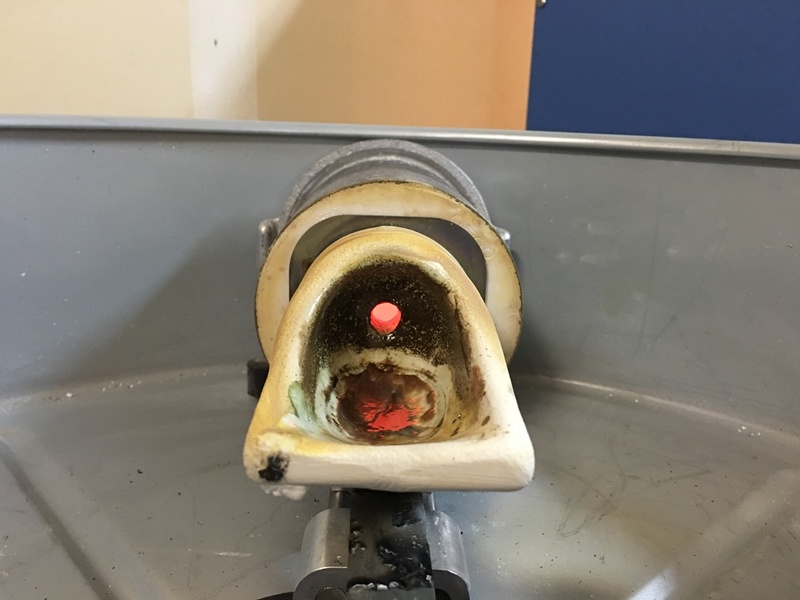 This creates a pathway for the molten metal to flow and take the place of the wax during casting; hence the name of the process, lost wax casting. I strategically attach wax wire to each wax model, then attach that to the main central sprue. When building the tree it is vital to think about how the wax will flow out of the mold, and how the metal will flow into it. Now Richard creates a mold for casting. This is called investing. The trees are put into stainless steel flasks. He creates a mold around the wax tree with investment, which is a very fine plaster. The investment has to go through various steps including mixing and then vacuuming out the air that gets introduced from the mixing before it sets up. He's got 9 minutes. 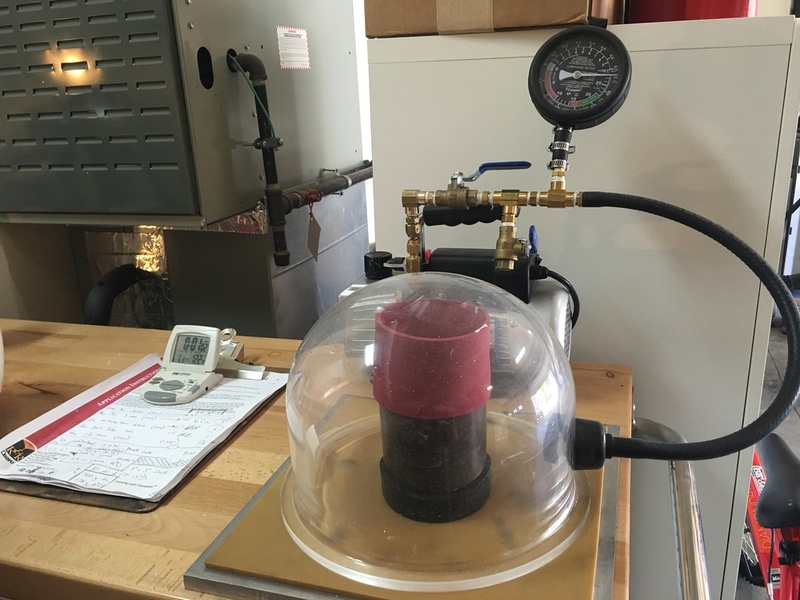 The flask is put into the vacuum chamber, then vacuumed to pull the air out of the investment. This prevents bubbles from clinging to the waxes. On the right, you can see the air being pulled out of the investment. The same process is used when Richard makes the rubber molds shown in the previous pictures. Next, Richard puts the flasks in an autoclave to melt most of the wax out of the flasks. 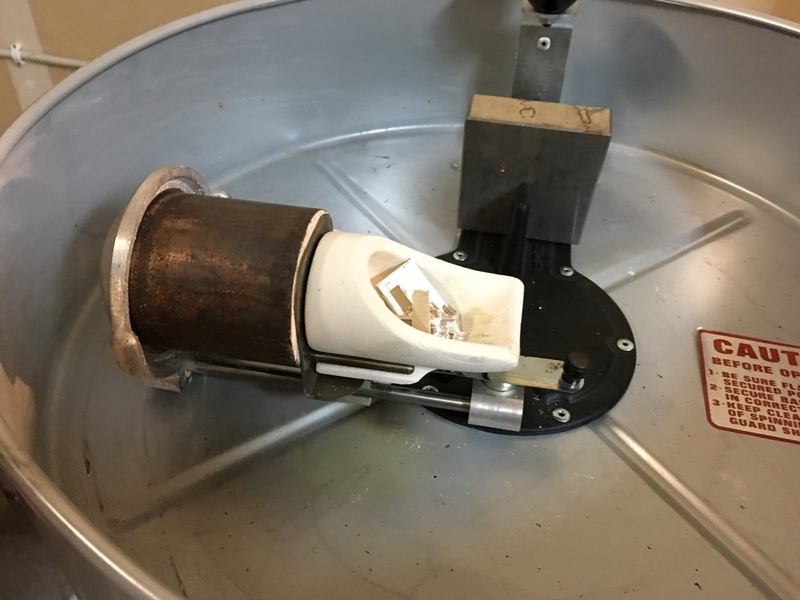 This step makes the process kinder to the environment by containing the fumes from the melting wax in the pressure cooker rather than releasing them into the air during the burn out process in the kiln. It also makes for a cleaner burn out which gives us a more pristine result in the casting. The flasks dewax in the steamer for about 2 hours. Then the flasks go into the kiln. They go through the burn out cycle for 3 hours at 300 degrees. After the burnout, the kiln slowly builds up to 1200 degrees or so depending on the metal being cast. This takes another 8 hours. During this part of the process the investment also hardens. Now we are finally ready to cast. The red hot flask is taken out of the kiln and set into the centrifugal caster. The metal, sterling silver in this casting, is put into the crucible. The whole thing is wound up, and under tension. Richard melts the silver with a torch. When the metal is completely molten, he releases the tension on the centrifugal caster and it goes spinning. The spinning action throws the molten metal into the flask. The red hot metal is now in the flask in place of where the wax used to be. That glowing red circle is the molten sterling silver. It needs to cool a bit before it is quenched. After about 15 minutes, the still very hot flask is quenched in a bucket of water. Quenching the hot flask causes the water to boil and break up the investment. Richard pulls the now sterling silver tree out of the water. On the left is the sterling silver tree. It used to be wax! The center picture shows the pieces cut off the tree. There is a lot of work to do. We grind down all the gating and file it to look as though it was never there. The black oxidation also needs to be removed. Then the pieces go through an 8 1/2 hour polishing process. I polish the pieces with varying grits of sanding disks, and then put them through the tumbling process. After the pieces are cast, cleaned up, and polished, I need to create the final piece of jewelry which includes soldering connections, pictured on the right. To finish the piece, I give it a dark patina to create depth in the design. Finally, I polish it again by hand. The end result is a rich satin sheen.